Benefits of Engineering and Design Meetings. Project coordination and planning can boost the efficieny of a project. Ryson strongly believes this and takes a proactive stand with our customers. At any stage of spiral production, the sales and design team is willing to sit with the customer any answer and questions or concerns with the project. Last week the service, engineering and sales departments joined in a conference call with one of our integrator partners and his conveyor fabricator’s engineering team. In an online video conference , we detailed the infeed and discharge side transfer in Inventor 3D to better illustrate to the fabricator how they needed to build the adjoining conveyors to ensure a smooth side transfer in and out of the spirals. We also discussed the coordination and scheduling of the project and set a date for a future conference call to discuss electrical controls, programming details and the installation of the spirals. This project involves our Mass Flow Spirals, transferring 16 and 24 ounce filled cans at a rate of 1200 per minute. Ryson High Capacity Mass Flow Spiral Conveyors are Elevating some High Volumes! The Ryson Mass Flow Spiral Conveyors have always been about vertically conveying product in mass. But with the addition of the High Capacity models, Ryson has taken vertical mass flow conveying to new heights. The Ryson High Capacity Mass Flow Spiral Conveyors are starting to change the way people think about packaging lines, particularly in the bottling industry. With the added volume capacity and extended height ability, the Mass Flow Conveyors are able to handle the demands of even the most high performance bottling plants. They are often used to feed empty bottles to the bottling area as well as conveying filled bottles to the packaging lines. With the Ryson Mass Flow Spirals, products are conveyed up or down in a continuous mass flow. Ryson Spirals have a small footprint and provide considerable space savings compared to conventional methods. 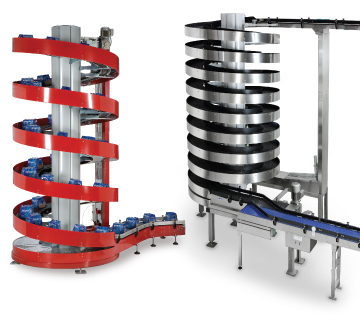 The Mass Flow Spirals are based on the already proven Ryson Spiral technology and are designed to handle full and empty bottles, cans, jars and similar containers. Only one drive motor is needed, equating to substantial savings in controls and systems integration. The Mass Flow Spirals are equipped with extended in and outfeed tangents to facilitate smooth side transfer to and from external conveyors. They can be delivered with 12”, 16” or 20” wide slats with capacities of up to 2,000 bottles or cans per minute. They are also available in powder coated carbon steel, stainless steel and washdown versions. Spiral conveyors have several advantages over traditional incline conveyors. These photos show how a series of Ryson Case Spirals are used to streamline the packaging area of a winery. The first two spirals lift the product overhead to clear aisle space and provide an open space for traffic and storage options. An incline conveyors’s footprint would have taken up considerably more floorspace. The second series of spirals lowers the product and provides transportation to either a bundler or palletizer. This gives the customer ultimate packaging flexibility, un-clutters the conveyor footprint and streamlines the packaging process. If you have any questions or have an application in warehousing or packaging that would benefit from a spiral conveyor, please fill out our form for more information. The integrator on this project was our sister company Apollo BV. Ryson Spirals can be used to create aisle space and more operating area compared with a traditional incline conveyor. With a 3600 load capacity the Ryson High Capacity Spiral Conveyors are perfect for vertical conveying of heavy loads. This week we are shipping a high capacity 1700-400 spiral conveyor to handle pails of cat litter weighing 55 lbs each. The spiral also has a custom curved extended infeed to optimize the filling line layout in a very tight production area, eliminating the need for an ancillary “connector” conveyor. This 4 3/4 turn spiral will convey plastic pails from the filling area at floor level to a palletizer on the mezzanine level. The integrator, Arrowhead Conveyor Systems, realized that the vertical transport of this kind of weight was a perfect application for the Ryson High Capacity Spiral Conveyors. The spiral will ship in once piece after the spiral has been pre-tested and run for 8 hours in our plant. For more information on the workhorse of the Ryson Spiral Line, Download our product pdf or visit www.ryson.com. PackExpo will take place in Las Vegas in a few weeks. We welcome you to visit our booth and learn about the latest in vertical conveying solutions and how Ryson Spiral Conveyors can reduce your operating cost and the cost of ownership. Ryson will be exhibiting our standard unit load vertical spiral conveyor that can convey cases, totes and other packages vertically in a very small footprint. Our Mass Flow unit will aslo be running at the show – it is becoming very popular in the bottling industry as it can convey bottles, cans and jars vertically in a mass flow. Ryson will also display our new induction conveyor which allows spiral entry at multiple elevations. If you plan on attending, please stop by our booth. You may also contact us to set up a private demonstration or meeting. Read more about Ryson’s Booth at Pack Expo.